Hey everyone! I have two cards to share using the super cute stamp and die set from MFT, Cuddly Koalas. I had so much fun playing with this set...I couldn't stop! For my first card, I kept it simple and colored the sweet images with Copic Markers, then popped on a card panel. For the the card panel, I had just blended a bit of pigment ink and splattered with Gansai Tambi Watercolors. 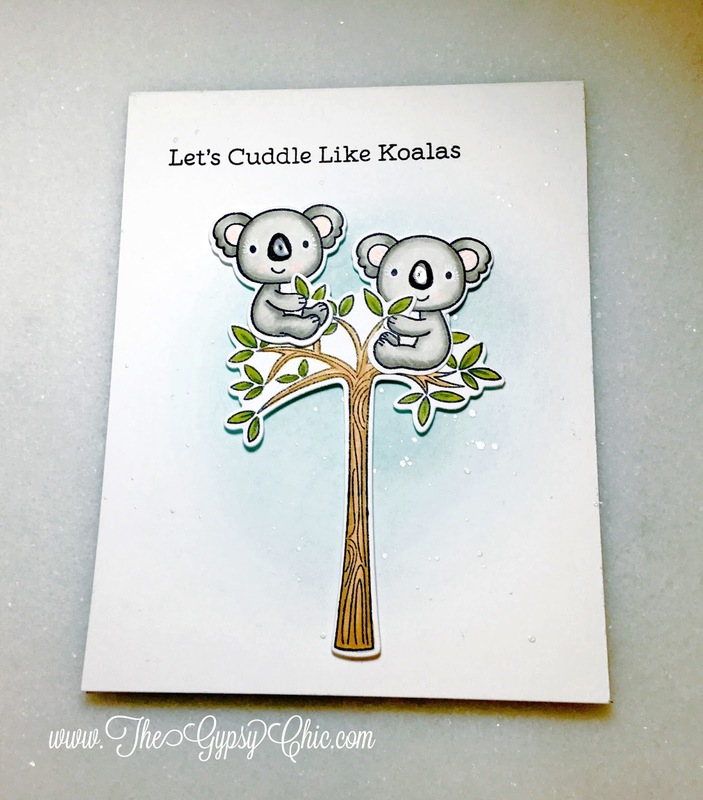 For my next card, I wanted to make the Koalas climb up the tree. So I made a slider card, which is pretty easy when you have the dies to work with. First I made the sunset background, by blending pigment inks. I think I would have liked this better if I had used distress inks...but I'm out of watercolor paper, lol! Then I splattered some white and gold specks with Gansai Tambi Watercolors Then I used the slider die to create a track for the Koalas to slide on. I colored all the images with Copic markers, and used Copic markers around the border of the tree to hide the white border the die left. I used glossy accents and a white gel pen to add detail to all of my Koalas.